A planning application (Ref F08A/0642) for a Temporary Park and Ride Facility has been submitted to Fingal County Council. Located behind the Funeral Home and Filling Station, it will be accessed through the narrow Weavers Walk opposite the Clonsilla Link Road. The facility will accommodate 280 cars, almost twice the size of the car park at Coolmine. This is a private venture and will do nothing to alleviate the chaotic parking in the vicinity of Clonsilla Rail Station. Most commuters will continue to avail of free parking in nearby estates and roads. In fact it is likely to make things worse as hundreds more cars descend on the Clonsilla Road in the mornings and queue up to get in. Those unable to find space will simply dump their vehicles wherever is most convenient before running for the Train. As well as the congestion and pollution, there will be the usual problems with litter and vandalism just like Coolmine. The facility is to be a temporary one and presumably will be built on eventually so it’s likely those using the park will seek to continue parking elsewhere in the area. On Monday Fingal County Council publishes its long awaited Clonsilla Urban Centre Strategy. This report will suggest that a park & ride facility “would attract further extraneous traffic and degrade the Village”. I hope the planners will take this into account when making their decision. 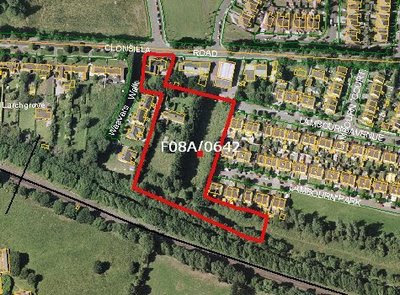 Incidentally the report has labelled the site as “Opportunity Site 2” with potential for 48 residential units comprising 18 x 2 bed apartments, 27 x 3 bed houses and 3 x 4 bed houses. You may make your own views known to the council’s planning officials, by means of a written observation. This is a simple letter giving your name, your address, the file number and your views on the proposed development. It must be received by the council no later than Thursday June 26th and a €20 planning fee must be included for it to be valid.